"Find our schedule and menu on @goodfynd! "... Thu, Apr 25  11a - 2p " Farragut Sq (17 & K NW) ... https://t.co/HoyPrLG95M"
"Find our schedule and menu on @goodfynd! "... Thu, Apr 25  11a - 2p " Navy Yard (Canal park) ... https://t.co/JS2Q7nBcBU"
Customer service was great, and fast. Gyro meat was chopped cube, not my favorite style but crispy and flavorful with out being dry. The pita was thick and chewy, the veggies were a bit bare but the spicy sauce was wonderful, not really spicy but brought a creaminess and twang. Having the fork was nice as the pita was overstuffed with meat. This is the absolute best halal truck, and believe me, I have tried them all. The chicken does not have chunks of fat hanging off of it, and the gyro meat is diced into the perfect size. I also appreciate the diced chicken as well. I do not like the larger pieces that other trucks give because the larger pieces tend to be dry and/or without flavor in the middle. You absolutely cannot beat the prices of the menu items on this truck. The line is always long, but it moves quickly. LOTS of flavorful rice and some chickpeas (+ lettuce). Very tasty, the tiniest bit spicy, and the tatziki sauce is excellent. Will probably go back when none of my favorite trucks are around. Combo Platter was ok. Could have been better. First time eating from a food truck. Have tried the Halal Cart in NY which is great. They need to use the Yellow Rice and provide more meat and sauces. Unfortunately they did not include the pita bread with my food :(. Went to a local restaurant to get a gyro and had to throw it out. So I went to the food trucks to get a repacment and this one was not that bad but defintely not best. To sum it up, I only ate most of the meat and sauce and threw the veggies and naan away. Today I made my second purchase from a food truck, and boy did I hit the pot. I went to the same truck as my first time (see review below). Food was great as before. I ordered a little before noon, and by 3:00 I had made two sprints to the loo. I note that the reviews tend to be split about 50-50 on this truck with love it or hate it ratings. I'll probably try this truck again to hopefully determine whether this visit or my first visit is the norm. This was my first purchase from any food truck, and boy did I hit the jackpot. I checked them out on Food Truck Fiesta, saw that their prices are reasonable (better than many other lunch-type food trucks), and saw that one of their trucks was near me at the Navy Yard today. I ordered the chicken on pita. The chicken was uniformly both tender and seasoned. The "pita" is really a gyro bread that was softer, easier to handle, and tastier than pita. I opted for the hottest sauce, which is not overly spicy but hot enough and just right for lunch on a work day. The sandwich slowly fell apart as I ate it, something I usually really don't like, but the taste of this was so good I couldn't care less about that. They thoughtfully gave me a fork with the sandwich for eating the bits that fell out. I'll be on the lookout for this truck. This is the second time this truck has ripped me off. 🙁 I ordered extra chickpeas and didn't get them even though I was charged. Last time I was over charged for bread. Went to Truckeroo this evening. I was waiting on the Takorean line and a broad in front of me was dogging a gyro. I see the truck, had a small line, so I decided to get one. I hadn't had a gyro since I left NYC. It was good, good sauce, and a friendly staff. Its not a NYC type gyro but it tasted good. I'll be following them on twitter. Got to the buss and the guy said 2 minutes which turned to 17 minutes. After waiting 17 minutes the guy wanted me to wait 6 more to finish cooking the chicken that was supposed to be done 10 minutes ago. Really bad customer service. I will not go there again and I suggest you do the same. 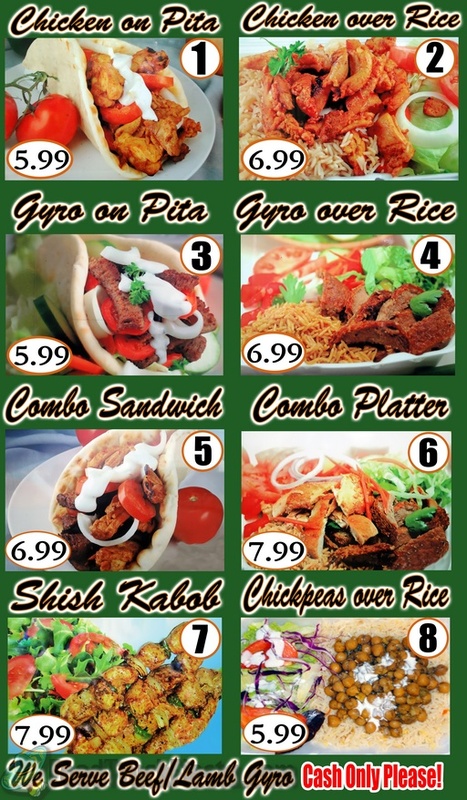 Halal Grill launched on June 2, 2011 in Washington DC. 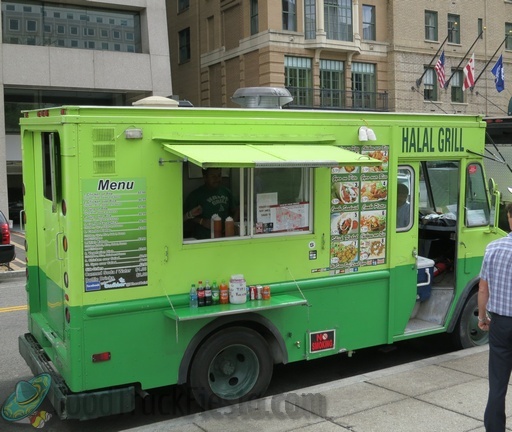 It is the second truck from the owners of the Halal Gyro Plus truck. 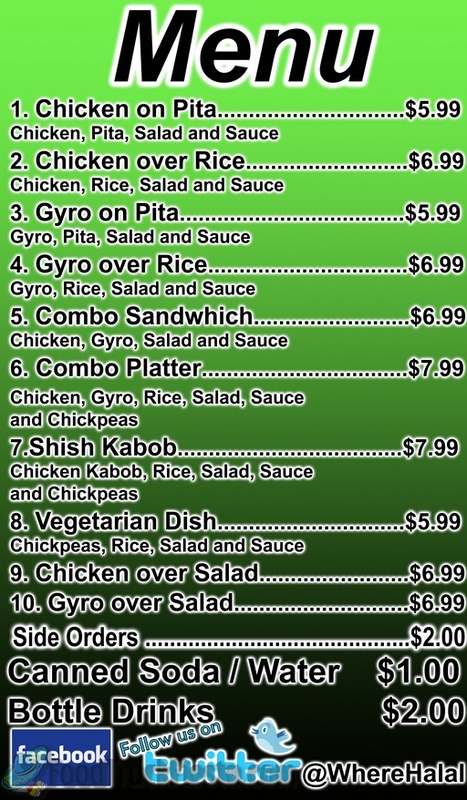 Halal Grill accepts credit cards and the pricing does not include 10% tax.